When Matt Hodges joined Intercom in March of 2014, our marketing team headcount grew from zero to one. As Intercom’s original marketer, Matt has been instrumental in shaping our go-to-market strategy around the Jobs-to-be-Done methodology and scaling marketing within our organization, among many other notable accomplishments. Prior to joining Intercom he spent several years at Atlassian, where he played a key role in the market positioning and growth of the Confluence and HipChat products. I recently sat down with Matt for a wide-ranging chat about product marketing in SaaS. We discuss how Jobs-to-be-Done can shape your product’s marketing story, how to decide what updates and features are worth shouting about, tips for startups to scale their own marketing team, and much more. 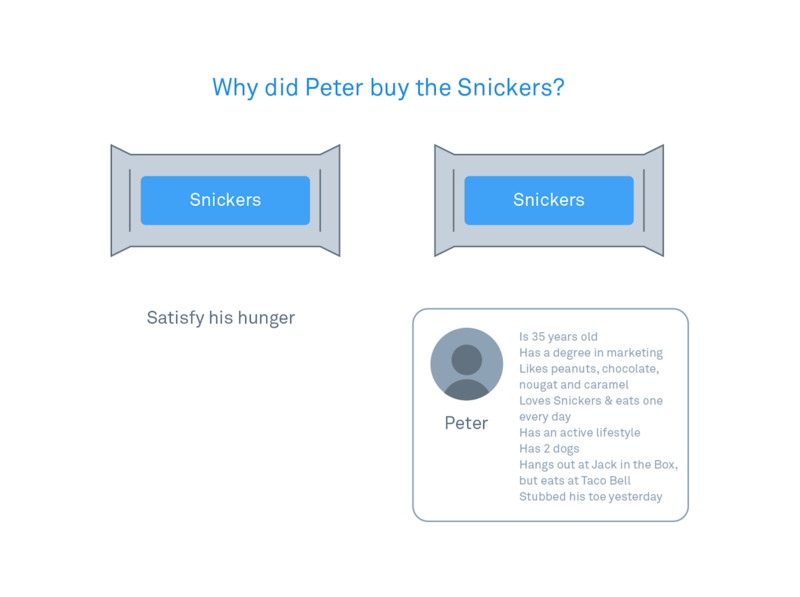 The issue with persona-based marketing: It can lead product marketers to focus on what you want to sell rather than what people actually want to buy. Jobs-to-be-Done emphasizes the latter. Product marketers are tasked with convincing people to invest time and change their behavior, which is incredibly hard. Crafting a compelling story around your product and the problem it solves is key. The product and marketing teams need a shared understanding of what they’re building and why. At Intercom this begins at the project brief stage. Many SaaS companies ship more than 100 features and updates per year. Marketers need a prioritization system for deciding which to promote. If you shout about them all, consumers will stop listening. If you’re a product-first company, your first marketing hire should be in product marketing. They’ll craft the narrative for your product and have experience working with other marketing disciplines – content, demand generation, etc – that you’ll incorporate in the future. Des Traynor: Welcome to the show, Matt. What made you want to be our first marketing hire? Matt Hodges: About two and a half years ago, I was at Atlassian, an Australian software company mostly known for products like JIRA, Confluence and HipChat. I’d been working for them for six years and seen them grow from 90 people to more than 1,000. Looking through my LinkedIn InMail, I had got a note from a company called Intercom, who I’d never heard of. Long story short, I ended up on the Intercom marketing site. I got a good sense for what their product does. I thought, “Hey, that’s something I would actually use myself.” The product looked great. Then I got stuck on the blog for about three hours and started to get a sense of, wow, these are some really smart people. I could learn a lot from them. The rest is history. Des: When you started one of the things that we were keen to warm you up was the idea of Jobs-to-be-Done. We had no clue what that really meant or how it would vibe with your perspective from marketing. Up until that point, we had no marketing, so we had no real appreciation of how valuable it would be from a marketing perspective. How did you take to it? Matt: I’d never heard of Jobs-to-be Done prior to learning about it on the Inside Intercom blog. It’s an incredibly powerful tool once you get your head around it. That moment when I really understood what it was and how we could apply this to taking a product to market was Clay Christensen’s classic milkshake video. It made me think, wow, that’s a really different way to think about why someone would buy a milkshake. Then there was the workshop we did with The ReWired Group two years ago, where we really started to see – as you dive into the conversations that you have with people – the patterns that emerge and the common language used to describe why someone hired a product. That was the validation to me that there’s something behind this and we could definitely apply it. Des: Obviously Intercom wasn’t your first marketing gig. How did Jobs-to-be-Done change you as a marketer? Matt: It was really taking a few steps back and understanding that one reason someone is hiring your product in the first place. Once you get to that point, the rest flows from there. In my previous experience, I probably leaned too much on persona-based marketing, which a lot of marketers tend to do. You think about, who are the different types of people buying my product and why? What often ends up happening is you focus too much on marketing what you want to sell rather than what people actually want to buy. I moved away from purely focusing on personas and really starting with the job, but persona-based marketing can come later and adds value to the Jobs-to-be-Done approach. Des: The piece I’ve come to appreciate about personas is that jobs are excellent for letting you frame the offering in a way that customers understand and actually have a desire for, but they don’t tell you how to reach your customers. At some point, it is still useful to know if I’m trying to target 18-25-year-olds, I won’t put up ads in old age homes. We’ve certainly written about being a bit more anti-persona from a product standpoint, but there’s still a legitimate use-case is when you’re trying to work at how to reach people. Matt: Absolutely. I like to talk about attracting people and what types of content I’m going to produce to attract the right audiences. What are the right topics of interest to the people that could hire this product? When you start to actually think about the convince phase, which is convincing them you have a product that can be hired for the job they need to get done, personas are actually really important. It’s really important to frame it in the right way for the different audiences. You are going to have different personas that are going to hire your product for a job, but they’re going to talk about it in a different way. They might use different language. Certain things that help them perform that job are going to be more important than others. Having an understanding of the audience or personas is important for helping you understand what to focus on when you’re talking to a different set of audiences. Des: Is that like knowing the way in which you convince a VP at a 2,000-person company is different than the way you convince the head of product at a six-person company? The former is all about ROI; the latter is going to care about experience and just good product. Matt: To give a really simple example, look at Intercom’s Engage product, which is built for marketing and growth teams to help new users see value in the product they’ve just bought or signed up for. The things that are going to be important for a product marketer are going to be things like, does the composer work? Am I going to be able to create the best looking messages? Am I going to be able to target the right audiences? If I’m selling to a C-level executive, they’re going to ask, is the money I’m spending on this product going to bring me back more money at the end of the day? Things like reporting and showing return on investment are important to that persona. Des: Even if you are selling to a product marketer, the C-level might be involved in buying anyways, so you still need to have a more different way to pitch it. Matt: Exactly. At the end of the day, the job remains the same. Des: One thing you drilled into us from the very start was the importance of having to write story and how it comes ahead of, frankly, everything else. I know Amazon is well documented for having their “work backwards” philosophy, where they write the press release before writing a single line of code. Why is it you need to work on a story independently from a product? Is the product not the story? Matt: There’s a very powerful quote that I like from Simon Sinek. “People don’t buy what you do. They buy why you do it.” It’s really important to focus on the why. What are you delivering to the customers? That comes through storytelling. People don’t typically come and buy a product just because of its features. They buy a product because of the value it delivers, so it’s really important to think about the end-to-end story you need to tell. Des: Is that because it just won’t resonate? What makes it hard to sell? Matt: Exactly. You need to convince people why they should invest the time changing their behavior. As we know, changing people’s behavior is incredibly hard. You need to convince them that the way you’ve been doing things is either wrong or is actually not the best way you could be doing it. That’s why storytelling is important to capture their attention and encourage them to invest time in learning more. Des: It makes sense to me that what we’re saying to our customers is actually practical. Cynically, I feel like what we say to the media is the more flashy stuff. How do you pick out that piece? Matt: As it pertains to SaaS companies, the media will definitely talk about funding. As it pertains to your product updates, you really do need to latch onto a trend, and that all comes down to timing. What is the trend that people are talking about in the industry at that particular point in time? Right now, there’s a huge trend around messaging. That is potentially something that if we have an announcement from Intercom, we might want to latch onto. Des: If you have this story, what’s going through your mind when you decide the visual composition of the marketing site – whether it should lead with a screenshot or a video or a lot of text? Is it a conscious tradeoff? We have pretty long pages, but we also change it up a bit. How do you decide? Matt: Going back to the size or the magnitude of this thing that you’re shipping, if it’s something that people are immediately going to understand, then lead with a screenshot. There’s no need to paint a picture and tell a bigger story around that. People know they want it. They need it. There’s other things which require you to take a step back and frame the problem and your solution. That’s where you might want to use other visuals like illustration to get rid of all the UI and the Chrome. It really depends on how complex the problem you’re solving is. Des: If you think of the standard product marketing site for the app you see on Product Hunt, you’re always going to see a screenshot on the right. There’s a sign up button on the left with three words like “ticket tracking, reinvented” or “email revisited for 2016”. Is that basically the lowest common denominator of product marketing? Is it wrong unless your product is pretty self-explanatory? Matt: Yes and no. I think we’ve spoken about this concept before where sometimes people skip the job altogether. They know what they want. They have a really good understanding of what they need, and they search for a specific set of words. When people skip the job and they know exactly what they want, show them what they want. Matt: A point of contention within Intercom is how I would describe our Acquire product. There’s this existing product category that is live chat. While our product is not just live chat, that’s definitely how a lot of people today think about products in that landscape. So we describe it that way. But there are some people who don’t actually know they should be putting something like Intercom on their website so they can talk to visitors, because everyone that comes to your site is an opportunity for a sale. It really depends on the audience. You should be really thoughtful when you use screenshots and really bare bones marketing versus telling a bigger story. Des: You’ve seen both sides of the SaaS revolution in a sense. In a world pre-cloud-dominance, we had shrink-wrapped software, or pseudo-shrink-wrapped that was released once a year, regardless of whether or not they had to press CDs. Today, every single time I open the app store on my phone, I’m getting 60-70 updates to all the different products out there. I presume that’s triggered some sort of repercussions in terms of how you think about marketing. What’s happened there? Matt: I’ll back up and talk about my experience at Atlassian. I started at Atlassian in 2008, at a time when cloud wasn’t really a thing. SalesForce was just taking off. All of our products at the time were shipped in a fashion where we would have a big point release probably two, sometimes three, times a year. You’d have your Confluence 4.1 or your Confluence 5.0, and it would be a collection of 12 or more features. Marketing would to then create a narrative or story around those 12 or so things. That presented a really big challenge because not all of those features made sense together. Sometimes, you’d have a common theme or a couple of themes that you could tell a story around, but what it meant was you’d focus on two to four things, and build a box around that and the story that we wanted to tell around those things. Everything else was kind of forgotten about. That means that some of the important things you shipped, which might be relevant to existing customers or even prospective customers, just gets lost amongst all the noise. They don’t make the story because they distract from it or they make it confusing. Des: Let’s say we’ve got four features around productivity and also have a lot of new stuff around permissions and composition, but we’re going to tell this productivity story this time. Is it that sort of thing? Matt: Exactly. I go back to Confluence 4.3. We had tasks that you could put into pages and then reporting around those tasks. Then, a new mobile app, and we were able to construct this narrative around productivity. We also had a bunch of features that we’d added to the editor that were really important and really top-voted feature requests from existing customers, but they didn’t make the cut because they didn’t fit into that productivity narrative. We’ve now moved into a world where we have lots of things to talk about. The challenge then becomes which ones do we shout about? When you’re only getting two to three opportunities a year to shout, you shout with each and every one of them. When you have cases like Intercom, where there’s one-hundred things to shout about, you can’t shout about each and every one of them because people will stop listening to you. Des: Obviously you’re going to prioritize, but how do you make those decisions in an informed way? Matt: We’ve created a pretty simple framework that we use at Intercom to help classify the things that we’re building. We call it a launch priority level. It’s got two axes. On your Y-axis, you have innovation. Is the thing that we’re building a new invention? Is it solving a problem in an entirely new way, or is a “me too” feature? Is it filling a gap in our product today? On the X-axis, you have value. Is this thing that we’re shipping mostly valuable to our existing customers and it’s something that is going to retain customers? Does it produce an opportunity to attract an entirely new set of customers? 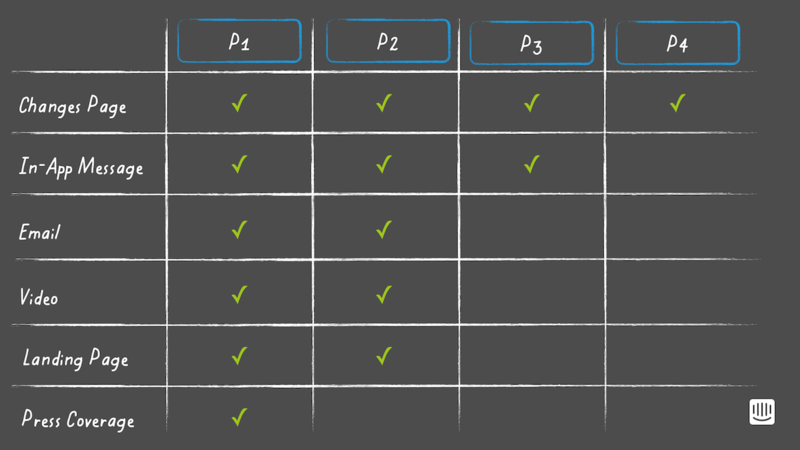 We have this framework that we use to classify an announcement as either a P1, P2, P3 or P4. A P1 is your big announcement. These are the things that you really want to shout about. It’s either a brand new product or a new invention that solves a problem in an entirely new and better way. These are the things that are going to attract new customers and they’re new inventions. In the top left of the quadrant is where you are building a new solution to a problem, but it’s mostly only going to be relevant to your existing customers. You’re probably not going to get press coverage on that, but it’s still something that you want to communicate. You’re going to focus on telling that story to your existing set of customers. We have this classification system and it becomes really valuable in helping you understand what level of investment and marketing to put into each announcement and make sure you’re not shouting all the time. Des: What’s an example of a recent P1 at Intercom? Matt: A good example is our Smart Campaigns release. It was a new feature that we’d added to our Engage product. When I say feature, it’s actually a collection of features that were bundled into this thing that we called Smart Campaigns. The reason we classified it as a P1 was we believed that it was solving a problem that marketers had in an entirely new way. We had gone back to first principles and we’d really solved the problem. It was also an opportunity for us to attract new customers because it was actually an area of our product that was preventing people from using Engage in the past. Des: For a P4, is this just something like our change log, where we make sure to have a means of telling people about it? Matt: Everything needs a classification, so a P4 is kind of a catch-all for everything else that might be a minor improvement or particularly important fix to an existing feature. It’s something that we tell everyone about using our public change log that lives inside the Intercom app and publicly on the web, but do so in a very non-intrusive way. 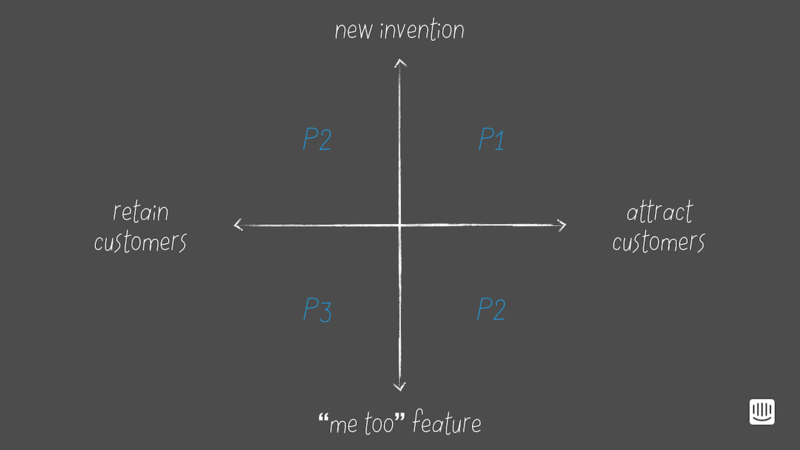 The other classification that is particularly interesting is the “me too” features – those gaps that you’re filling in your product that are either preventing people from using your product in the first place or the reason people leave. You’ve got these P2s that are “me too” features, but actually present an opportunity for you to attract a new set of customers. I’m going to go back to our Assignment Rules feature there. 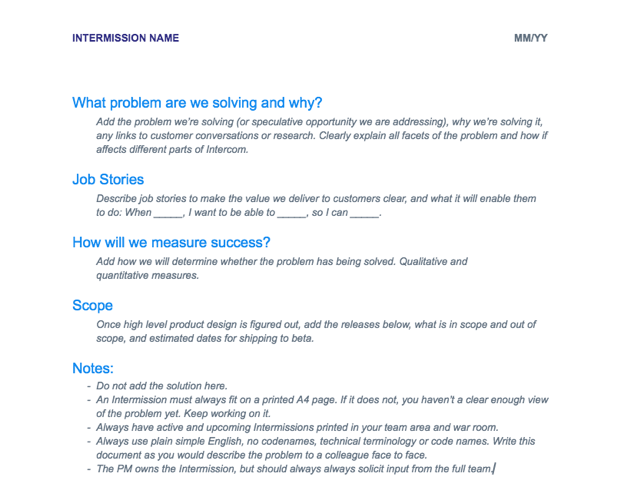 I believed we solved the problem in a better way, but because it allowed bigger customers to use Intercom for the support job, it actually presented an opportunity for us to attract a new segment of customers. Des: At Intercom, our product team gets more than once to roll out a feature. They get many chances. Sometimes they need them all. To what degree is it still true in SaaS companies that marketing only gets one chance to make their impression? Matt: It’s very true. 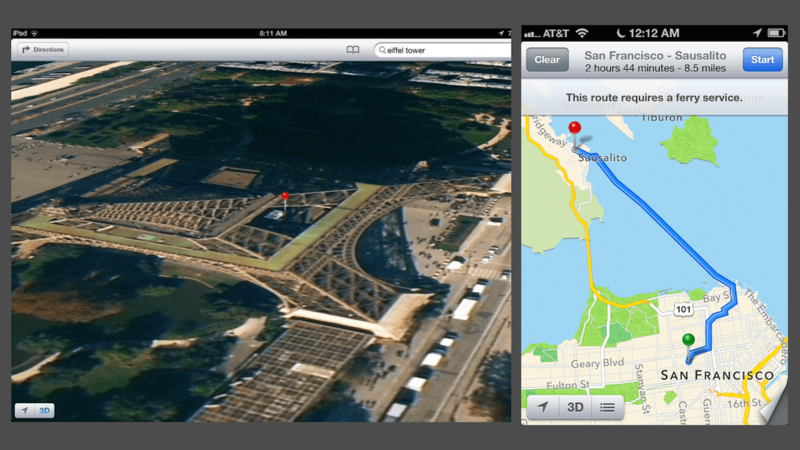 A classic example that we’re probably all familiar with is the release of Apple Maps. It was a flagship feature that was part of the story of iOS 6, which Scott Forstall got up on stage and presented to the audience at WWDC. Unfortunately for Apple, it was pretty much an utter failure. The product just didn’t work in the way that they had described it when they had announced it. That’s a good reminder that it’s very important the product you ship lives up to the marketing story you’re telling. All Apple maps did was remind how everyone how good Google Maps is. Des: One conclusion of that is you just don’t get to iterate marketing in public. Sure you can A/B test your homepage, but when it comes to big bang announcements you are going to communicate some things to a lot of people at the same time. There’s no point in tweaking that the day after, right? The chance is gone. Matt: You really do have one chance. You will make mistakes and you’ll learn from those mistakes. It’s important that you don’t continue to make them because the more times that you announce things and the more times that you either underwhelm people or you let people down, the less likely they are to trust you in the future or even pay attention to you in the future. Des: Going back to where we started, you joined us as a marketing team of one. Most of our listeners and readers are at startups that probably just hired or are about to hire their first marketer. Some of them are cynical, weary, scared. What’s your advice to someone coming into a company as the first significant marketing hire? Matt: It’s very important to start off with a clear understanding and set of expectations with whoever you’re reporting to. Obviously at a company the size of Intercom when I joined, that happened to be our CEO, Eoghan McCabe. What are the three things that you should be focused on from the get-go? Make it three things max. That’s incredibly important. To give you a sense of what those are, because I think it’s helpful for someone making their first marketing hire, the first was to put a framework and process in place for how we make product announcements. We were talking a lot about that today. You have a product team, and they’re building great new things, and they’re shipping all the time. You want to make sure people know about them. That was number one. Number two was figure out how to describe and position this thing that is Intercom. That’s an ongoing project. It continues to evolve as we better understand the jobs people are hiring our products for and we improve those products that we have today and we build new products. Number three was to work out how to build a marketing team. Who do we need to hire next? If you’re a product-first company, start by hiring someone in product marketing. There’s two reasons for that. The first is that someone with a solid background in product marketing coming from another product-first company – Atlassian’s a good example here – is going to have experience working with all the other functions within marketing. When people say marketing, it’s actually a loaded term. People think of marketing as one team. It’s not. At Intercom, it’s six teams that all fall under this umbrella that is marketing. If you find someone that comes from a product-first company with a product marketing background, they’re going to have the knowledge of how a marketing team works because they work with events, content, and demand generation to take their product to market. They’re also going to be able to help you tell that story and craft that narrative that people are going to be attracted to when they’re looking to hire a product for a particular job. You want to get that right before you start to spend money in other areas, because there’s no point spending money to acquire customers if they’re going to come to your site and not resonate with or understand the thing you’re trying to sell them. Des: As a startup, how do you find great marketers? How does one find their Matt Hodges? Matt: I’m going to use the reason I joined Intercom as a tip here. Other than Intercom having a great product and me seeing an opportunity to come in and add a lot of value as the first marketer, what really attracted me was the people that I was going to get the opportunity to work with. I wouldn’t have known that other than interviewing with yourself and Eoghan if I didn’t find the Inside Intercom blog. Share the lessons that you’ve learned and share the way that you think and the thoughts that you have on how to approach marketing, because it will help like-minded people find you and hopefully encourage them to want to work with you. At the end of the day, people just want to work with other great people and learn. Des: That’s a good place to leave it. Matt Hodges, thanks very much.